An anonymous work of protest art appeared on Jackson Avenue in Long Island City on Wednesday morning, but unlike much of the protest art that has been seen on the streets of US cities lately, this one targeted a very local and specific issue: another work of public art. The piece was a response to the $450,000 commission awarded to Israeli-born, Brooklyn-based artist Ohad Meromi for his sculpture “The Sunbather” by a panel picked by the city’s Department of Cultural Affairs (DCA). 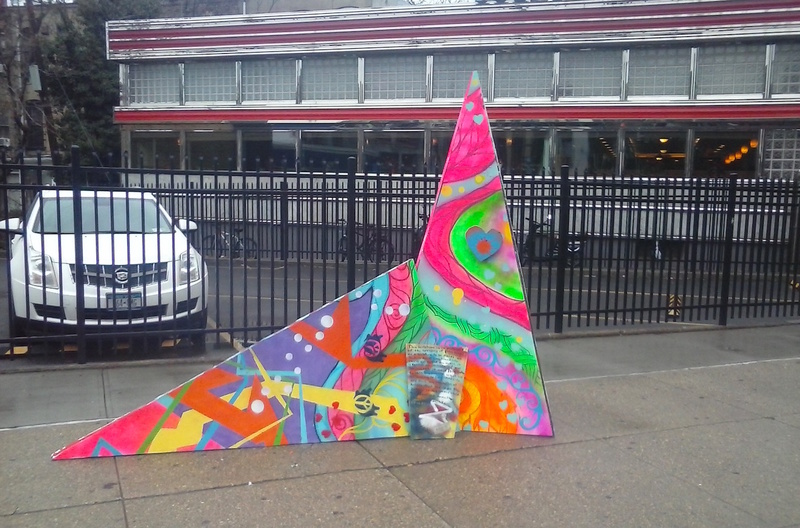 The anonymous plywood sculpture, which loosely resembled two connected triangles, one tall and narrow and a second long and low, was roughly the same dimensions as the proposed proportions of “The Sunbather.” The piece was sprayed psychedelically with swirling, vibrant colors and covered with hearts and bubbles, a possible parody of the bright pink hue of “The Sunbather.” The protest sculpture was placed in front of the Court Square Diner on Jackson Avenue, possibly due to its proximity to MoMA PS1. 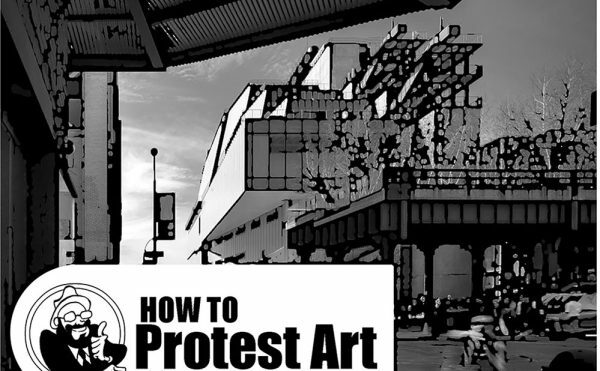 A statement outlining the unknown artist’s grievances was written in black magic marker on a plank of wood left leaning against the sculpture: “This sculpture is in protest of the spending of $450,000 on a sculpture to be placed on Jackson Ave. in Long Island City. 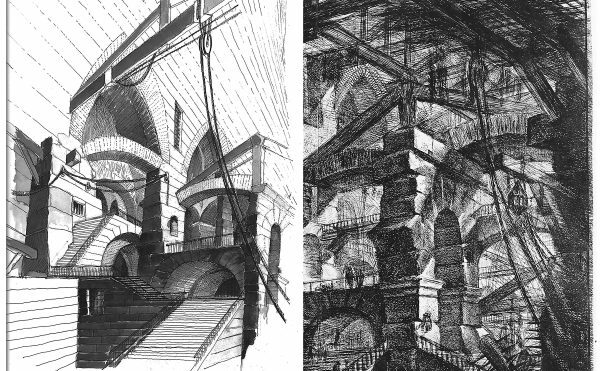 This is not against the artist. It is against the misuse of our TAX DOLLARS. 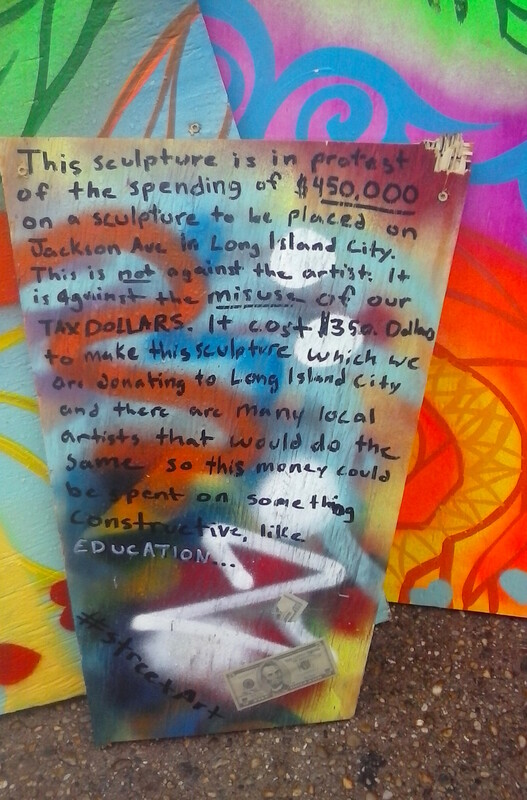 It cost $350 Dollars to make this sculpture which we are donating to Long Island City and there are many local artists that would do the same so this money could be spent on something constructive like EDUCATION… #streetArt” A five dollars bill was wheatpasted to the bottom of the message. “The Sunbather” has been at the center of local controversy as members of Community Board 2 seem dismayed by the DCA panel’s choice, Christian Murray reported in the Long Island City Post. 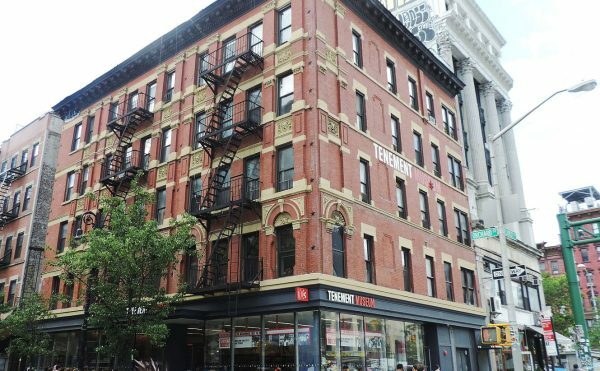 One CB2 member questioned why a Long Island City artist, who might have knowledge of the area, had not been selected for the commission. The DCA, through its Percent for Art initiative, is on track to install the sculpture within the next 18 months on the grass median at the crosswalk near the intersection of Jackson Avenue and 43rd Avenue. According to the DCA, the 19-member panel that selected “The Sunbather” included voting and adisory representatives from the Queens Borough President’s office, CB2, the office of the local city councilor, local organizations, and a number of city agencies. Correction, 12/15: An earlier version of this article claimed that “The Sunbather” had been selected by a three-person panel, as was reported by the Long Island City Post. The panel that selected “The Sunbather” was actually composed of 19 members.